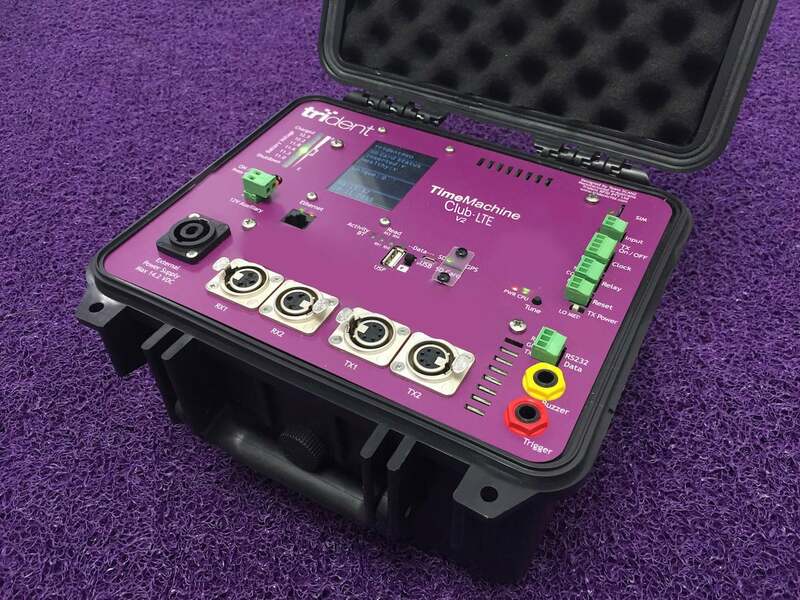 TimeMachine, the next generation of digital timing systems. 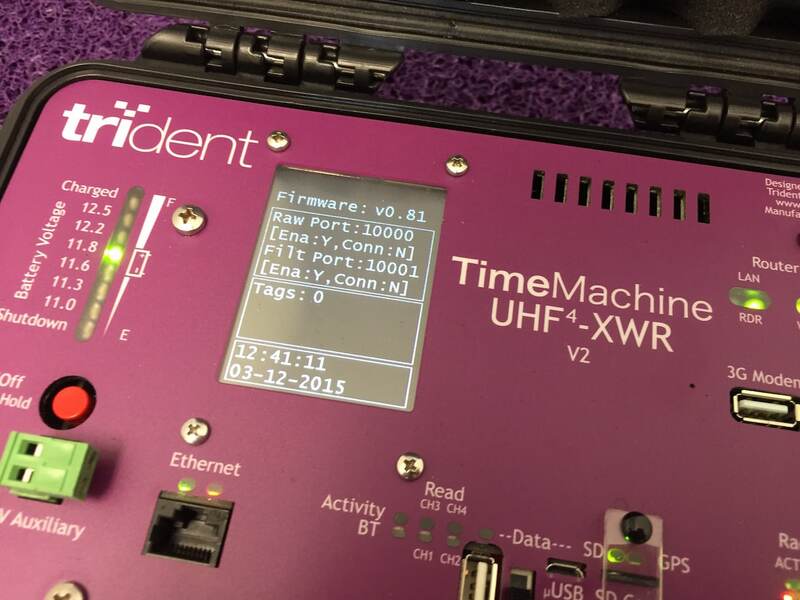 Our TimeMachine Readers come in two different technologies, Dual Frequency (DF) and Ultra-High Frequency (UHF). Each technology has different features and is best used for different type of events. The DF Technology is best for any event that has environmental factors, such as water, rain, snow, mud or ice. Typical events that it works best for are Triathlons and Mud Runs. The UHF Technology is best for high participation events. This is due to the lower tag cost, a significant factor when you reach 2,000 participant races. All races in-between can use either technology, though we highly recommend our DF technology for your event, as it is not affected by water or human interference, meaning better, more accurate results. We have three main reader categories you can choose from, DF, UHF or Hybrids. Your selection will depend on your usage. When timing a wide range of events, we recommend our Hybrid8 readers. These give the most flexibility, and allow you to utilise both DF and UHF technology, depending on the race you are timing. Timing a Triathlon? Use the DF technology with our amazing Infinity tags. Timing a 2,000 person marathon? Use the UHF technology and purchase cheap UHF tags. For events that are content with doing the same events each year, you want to pick a single technology. Either DF or UHF will depend on a range of factors, such as type of events, how many per year, and number of participants. Below you’ll find more details on each of our TimeMachines, or download our brochure. TM-Hybrid – UHF and DF all in one, 4 or 8 port UHF and 2 Port DF. 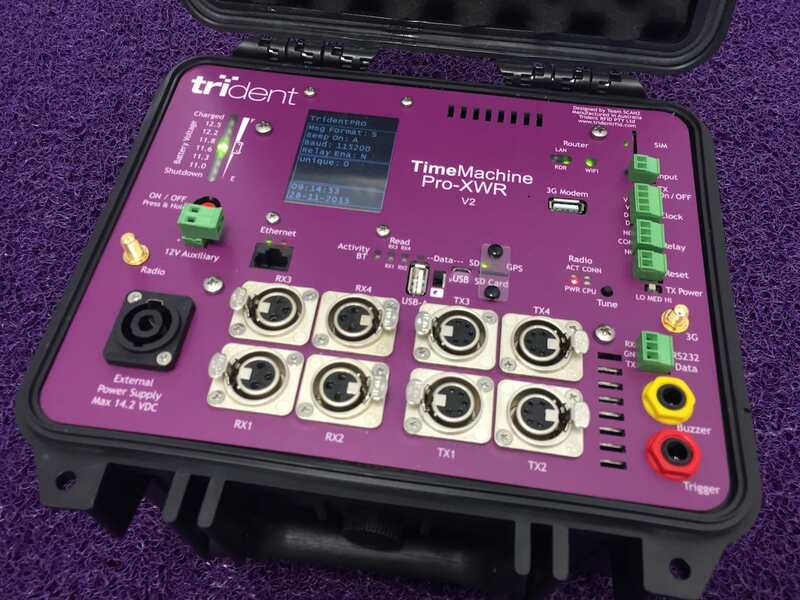 The TimeMachine Pro-XWR V3 is the professional reader with all the bells and whistles. We’ve added enhanced features by working closely with our professional race timers so everything you need is built into a lightweight ergonomic case, weighing in at only 7kg. Includes USB, Ethernet & Wi-fi communications with integrated 3G Comms and SIM card for web connectivity, with radio modem for mesh networking as an upgradable extra for remote split or spotter systems. Also has DHCP (dynamic host configuration protocol) allows network devices to automatically obtain a valid IP address. The standard system supports 4 x UltraMats or EcoMats. Start time is less than 1 second with system instantly ready from power up. All our systems come in bundles with all the tools you need to start timing. GPS is the most common true time source, TimeMachine now uses GPS for an accurate time source. So your TimeMachine will always be on the true time, making syncing your reader time a thing of the past. Transmit on/off button. Simply toggle on or off, allowing you to stop reading tags without turning the reader off. Improved interference and electrical noise immunity as standard. New minimised weak zones at ends of mats using time division multiplexing. We have built in Wi-Fi and 3G as standard. with the upgradable otion to include Radio Communications. Also has DHCP (dynamic host configuration protocol) which allows network devices to automatically obtain a valid IP address. 3G enables mobile ultra fast-broadband Internet access to your Pro reader along with a USB 3G dongle for your laptop. This means that the laptop and reader can talk to each other from anywhere with 3G coverage. If you don’t expect to get 3G coverage, we recommend upgrading to the point-to-point Radio communications built into your reader. The radio provides a wireless serial connection of up to 10 km so you can link your laptop with several Club or Pro readers creating a wide Local Network. 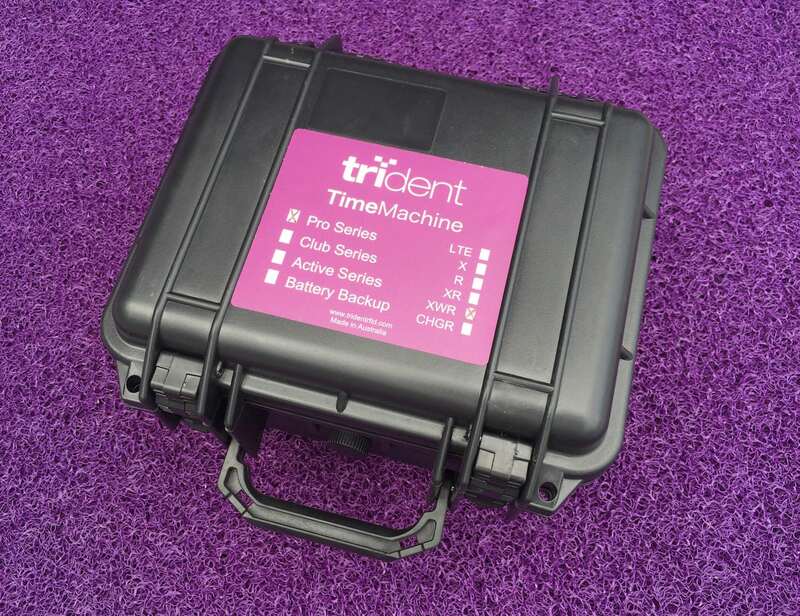 The TM-Club-LTE is ideal for small events and clubs. Club members aren’t timing events every day and often aren’t technically minded, so we’ve kept things simple on the outside to make it easy for you to set up, and turn on. But the smarts on the inside are all there and packed into a small, lightweight, waterproof plastic latched ‘pelican case’. The standard system supports 2 x 3m or 6m UltraMats and is up to 4 times more power efficient than previous models. That translates into 7 hours minimum expected operational life on the internal battery. TM Club-LTE V2 : the base system comes with Ethernet and USB as standard with Static IP address. All our systems come as bundles as well, so you can ensure you have everything ready for race day. The TM UHF V3 system comes with all the same great features that you are used to with Trident DF TimeMachines with minimal change required to move from the DF to UHF systems – everything is familiar and comfortable. 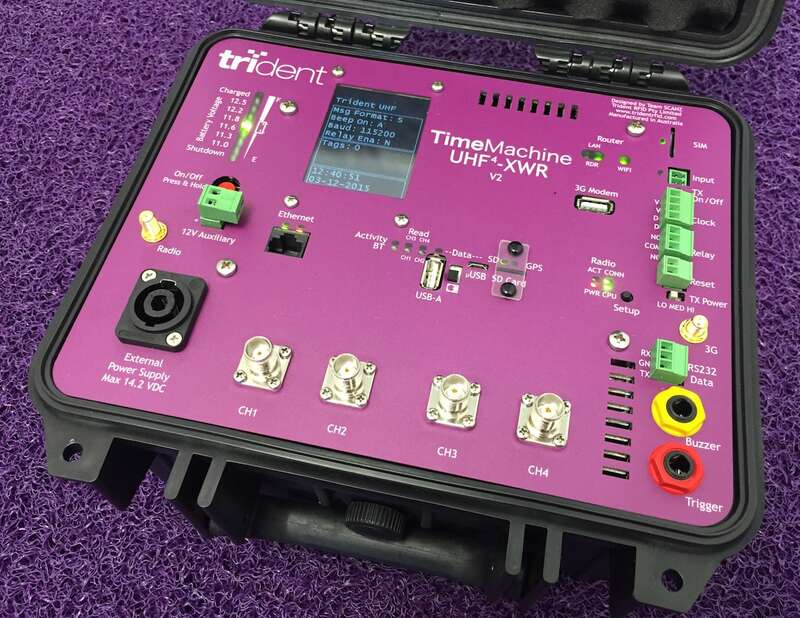 If you are new to Timing, and want a UHF system for Bib Timing and Cycling, then you’ll find the system simple and easy to operate and will be timing within minutes of opening the box. We also offer three alternate timing mat options including, Budget, European Low-Energy (works even better in the USA) and Ultra Low Profile to satisfy all Timers’ budgetary and performance requirements. We also offer high gain 12dbi antennas for those demanding requirements spanning an entire road width. TimeMachine UHF4 V2 with four antenna connections. TimeMachine UHF8 V2 with eight antenna connections. Big LCD with large font making it easy to read. 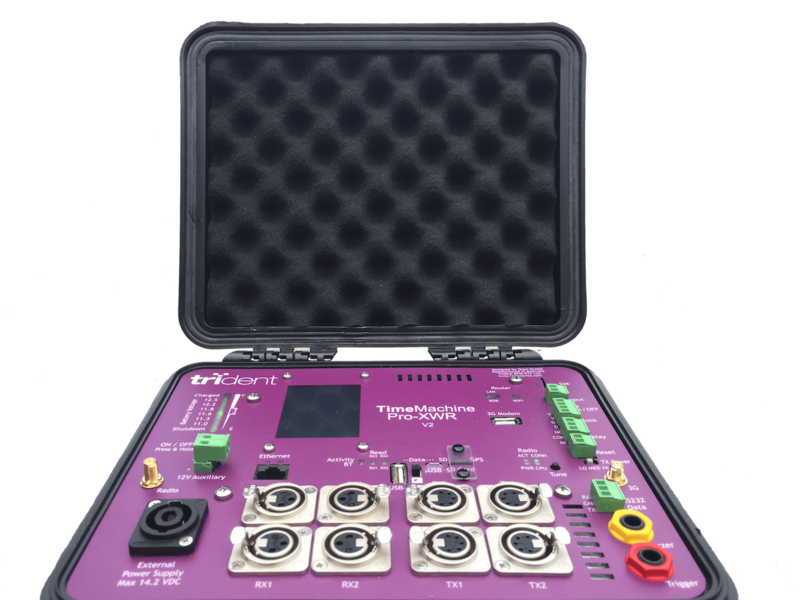 Detects and provides antenna connection performance operating parameters (SWR value) for diagnostics. Provides environmental noise information (background RSSI). Inventory speed: >400 tags/second for Gen2 and. Working frequency is 840 to 960 MHz with Listen Before Talk (LBT) function. The TM Hybrid V3 system comes with all the same great features that you are used to with Trident DF TimeMachines and UHF Machines, no changing required, you have both DF and UHF in the one system – everything is familiar and comfortable. TimeMachine Hybrid4 V3 with four antenna connections, 2 DF Ports TX and RX. TimeMachine Hybrid8 V3 with eight antenna connections, 2 DF Ports TX and RX. Inventory speed: >400 tags/second for Gen2. Supports 4 Port UHF Mats or Side Antenna, 2 x 3mtr Mats or 2 x 6mtr Mats. Fill in the form to the right and one of our experts will be in touch ASAP to help you.